Inés Garland was born in Buenos Aires in 1960. A voracious reader when she was a child, she wrote her first short story at age 11. At 16 she knew she wanted to be a writer, but it wasn’t until she turned38 that she had the courage to share her texts publicly. Before then she had worked a variety of jobs, including as an au pair, usher, barmaid, fitness trainer and television producer, and studied reflexology and kinesitherapy. She also worked as a freelance interviewer for various Argentine journals. After winning many awards, such as for the short story »El Remolino« (1998; tr. The whirlpool), she submitted a manuscript to Alfaguara publishing house. Her first novella appeared in 2006. Since then she has published five books more, »Una reina perfecta« (tr. A perfect queen), a collection of short stories, the young adult books »Piedra, papel o tijera« (tr. Rock, paper, scissors) and »Los ojos de la noche« (tr. The night’s eyes), a children’s book »El jefe de la manada« (tr. The pack’s leader), and another short story collection »La arquitectura del Océano« (tr. The ocean’s architecture). Many of her short stories have appeared in anthologies both in Argentina and abroad. Sensitive and nuanced, »Piedra, papel o tijera« is a coming-of-age story set during the Argentine military dictatorship. Garland masterfully examinesthe adolescentprotagonist’s feelings: torn between love, desire and melancholy on the one hand, and knowledge of the world, separation anxiety and a inability to communicateon the other. Garland frequentlyonly sketches in the political background of events, with much remaining vague and diffuse. She believes it is more important to examinehow political developments and conflicts affect individual characters and their relationships to each other, which Garland presents in a highly poetic way. In 2009 »Piedra, papel o tijera« was elected best novel of 2009 by the Argentine chapter of IBBY and was also on»Deutschlandfunk« radio’sApril 2013 list of »seven best books for young readers«.In 2014 the novel was awarded the German Youth Literature Prize. It has been translated to Dutch, French and Italian as well. 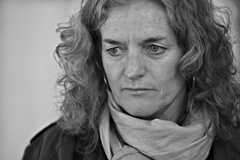 Garland currently teaches creative writing in Argentina and Chile, gives readings, and is engaged in state literacy programs for young people. She also translates other writers’ works from English into Spanish. Inés Garland lives in Buenos Aires.